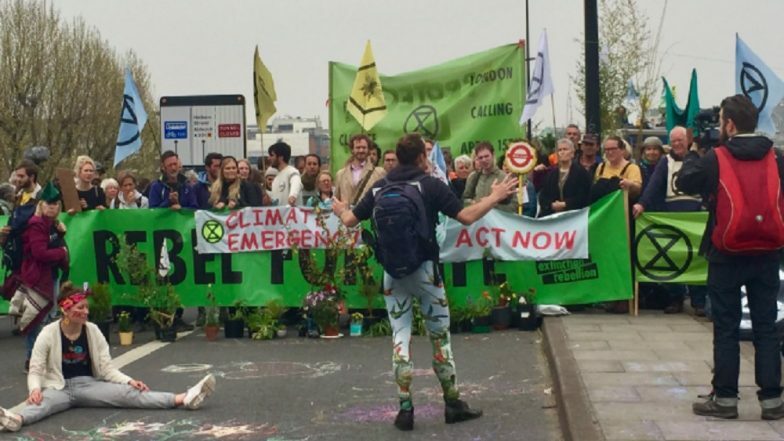 London, April 16: Thousands of people blocked well-known landmarks in London, bringing widespread disruption to the UK capital in a "climate rebellion", that organisers said could last several days. On Monday, parents and their children joined scientists, teachers, long-term environmentalists and other protesters to occupy major junctions and demand urgent action over the escalating ecological crisis, reports the Guardian. The protests are part of a global campaign organised by the British climate group Extinction Rebellion, with demonstrations planned in 80 cities across 33 countries in the coming days. The group is calling on the UK government to reduce carbon emissions to zero by 2025 and establish a citizens' assembly to devise an emergency plan of action to tackle climate breakdown and biodiversity loss. Five London landmarks - Waterloo Bridge, Marble Arch, Parliament Square, Oxford Circus and Piccadilly Circus - had been blocked by thousands of protesters. Bill Gates Explains Contributors And Effects of Climate Change Using Colourful Toys (Watch Video). By Monday night, police moved in and began to arrest protesters still blocking the Waterloo Bridge. By midnight there had been around 50 arrests. Extinction Rebellion, in a letter to May also on Monday, outlined their demands and asked for talks. Climate Change Claims Bramble Cay Melomys! Australia Declares the Great Barrier Reef Rodent Extinct Due to Habitat Loss. Organisers are hoping that the rebellion will last for several days and said its success depends on the number of people willing to occupy the sites in the days and nights ahead. The events in London were the biggest demonstrations but there were smaller protests in other cities around the world.